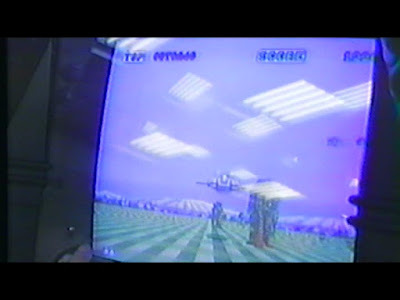 Reassembler - Emulation & Decompilation: The Space Harrier prototype featuring a Harrier Jet! 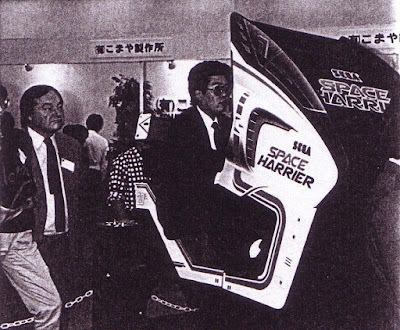 The Space Harrier prototype featuring a Harrier Jet! It's common knowledge that Space Harrier was originally intended to feature a harrier jet. However, technical limitations regarding the rotation of the jet sprite meant that this idea was dropped late into development. Recently, some screen captures surfaced from a video showing the prototype machine in action at the Amusement Show in Japan. The side-art and marquee are different. However, the colour palette and general aesthetic appear similar in the screenshots. The above cabinet design is similar to the prototype drawing that appears in Yu Suzuki's GameWorks Vol 1. 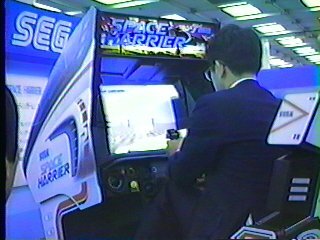 Of course, it was too late to change all aspects of the design, and Space Harrier still launched with an aircraft inspired control panel. The jet idea was fully realized two years and two hardware cycles later when Sega released the X-Board hardware with AfterBurner. Custom maths hardware, and extra sprite data enabled Yu Suzuki's original vision to be executed competently by this point. That is fascinating, I never knew it was originally going to be a jet - pretty obvious now I think about the name they chose for the game!